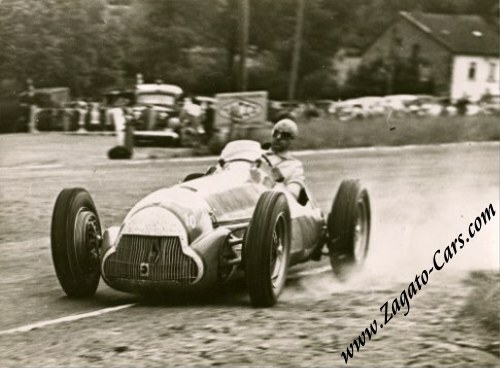 This is a vintage June 1950 press photo of JMF kicking up dust in one of the many turns of the Spa Francorchamps race track during the Belgian Grand Prix on June 18, 1950. Juan Manuel easily won the race in his 158 Alfetta, ahead of his team mate Luigi Fagioli and Louis Rosier on Talbot-Lago. 1950 was the first official Formula One season, making this photo extra special.